Countertop card spinner features (16) pockets to offer large selection! A countertop card spinner helps you increase space for merchandise or customer interaction on your counter by utilising a revolving display! 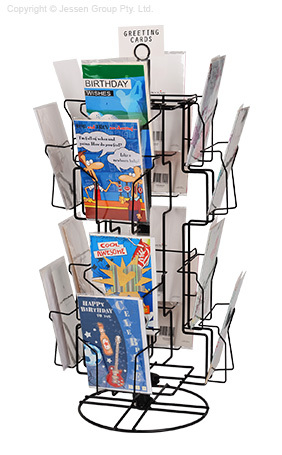 The rotating greeting card rack features (16) pockets on a spinning rack to provide easy access for browsing whilst taking up minimal space. The 345mm diameter base leaves heaps of room for other items to be placed without inhibiting this stand. Each side of the display features (4) pockets on for easy browsing. This countertop card spinner, tabletop brochure display, has 115 x 140 x 35mm pockets designed to hold leaflets, greeting cards, brochures, and more. The deep pockets let you fill the stand with stock without having to constantly refill the display. The stand uses a waterfall style tier to show most of each item on display to allow your customers to peruse with ease. The stand is 700mm tall to fit on a countertop without full obstructing view. The top of the rack has a holder for signage up to 1mm thick, ideal for promoting what is in the rack or displaying the sale price of merchandise. This counter top display is made from black powder coated steel wire to provide a lightweight, stylish, and durable display at a low cost to work within any budget. Designed for daily use, this stand is perfect for retail stores, coffee shops, exhibition halls, cinemas, news agents, museums, gift shops, and more to display their wares in a compact fashion. Order this display by 2pm EST from Slimline Warehouse to receive same day despatch to anywhere in Australia when in stock!